Multisport Mini Socks - Light Cushion - Mens is rated 4.8 out of 5 by 16. Rated 5 out of 5 by GwendleVs from Extremely comfortable I started by buying one pair of these to see if I liked them, and quickly decided that they would be my new everyday socks (I now have fifteen pairs, and I’ve gotten rid of the synthetic sport socks that I’ve been wearing for much of the last decade). I’m on my feet for most of the day in addition to which I usually walk to and from work, and these socks have the right amount of cushion to keep me comfortable throughout my workday. Recently I forgot to pack a fresh pair of socks in my overnight bag, and these were still comfortable on the second day. 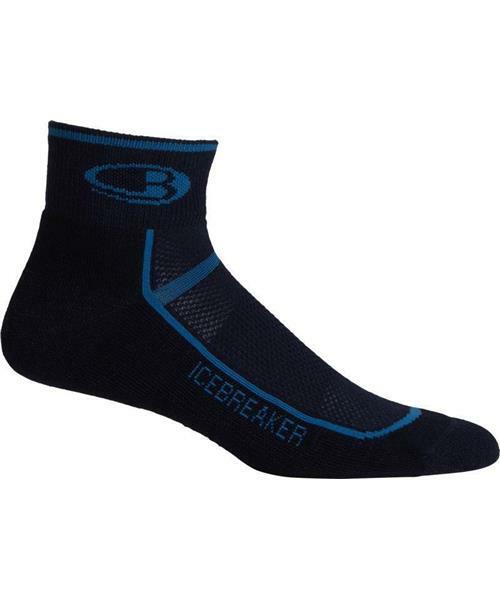 With icebreaker’s amazing warranty you can’t go wrong trying these. Rated 5 out of 5 by PeterJ from Multisport Ultra Lite Mini Great sock,,, very comfortable for cool and warm weather. Rated 5 out of 5 by Cannondalex911 from I walk 15km/day for work, and it feels amazing Like I said, I work as the mailman, so I can walk 15km a day, and my feet are grateful with these socks It's thick but breathable, it's long enough so it protects me from injuries and the elements and even if it's hot or cold outside, it's always comfortable I have 2 or 3 pairs of these and I would defenitely buy again. Rated 5 out of 5 by Budge from Great socks I use Icebreaker socks year round. These are perfect for summertime. Rated 5 out of 5 by MicSne from Long Lasting Socks I've owned many pairs of these socks over the years and they last for a long time. Nice cushion without being too thick. They also dry quickly. I do a lot of trail running and hiking and they are my first pick when choosing socks. You can't go wrong with these socks! Rated 5 out of 5 by abanmann from The perfect sock In the process of changing all my socks over to icebreaker. I've had other wool socks that fall apart over time but all my icebreakers have lasted. I have some approaching 4 years now. Rated 5 out of 5 by dylanmad from Good at getting a grip These seem like durable socks that don't have me slipping and sliding on a tiled floor. Excellent, that's all I need. Hope they last a long time!